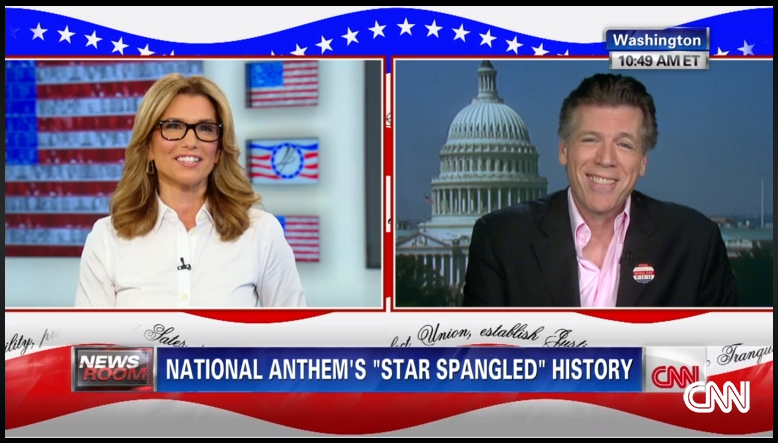 CNN introduced its interview with baritone Thomas Hampson (click here to view) with a recording from our Poets & Patriots project. It is indeed an early setting of Key’s famous text, but is certainly not the melody the lyricist had imagined. Nevertheless, it was a relatively well known version in the 1820s, especially in the Northeast, that was published in multiple editions. The music is by the American composer James Hewitt (1770–1827), who set out to replace the original tune Francis Scott Key chose for the song. The problem was that the original tune — “The Anacreontic Song,” composed by English composer John Stafford Smith for a London gentleman’s club — was decidedly British, which struck Hewitt as inappropriate for a song celebrating a victory against this same nation. So, in 1817 Hewitt took it upon himself to create an original tune, that he—as an explicitly American composer—could stand behind with patriotic pride. There’s no evidence that he consulted with or got Key’s permission to do this. Ironically, Hewitt himself (like much of American culture) was a British import as he was born in Dartmoor and had moved to New York in 1891. Nevertheless like countless immigrants, he could claim an explicitly American identity. Having listened to our Poets & Patriots tracks countless times during editing, I must say that I’ve grown to really love this setting. It is a march form (also with European roots), but has a vigor and stateliness that is very much in character with a patriotic anthem and really quite expressive (especially when sung well as by our UM American Music Institute Men’s Chorus). Click here to listen on Spotify. You can also hear the recording on our commemorative souvenir CDs of Poets & Patriots ($15 each) or by purchasing the complete recordings via Amazon or iTunes. Thanks to all those who wrote in to info@starspangledmusic.org with this question.